Working to suss out the role of femininity in the sustainability movement, I constantly discover new threads from literature I'm finding that ties it all together. 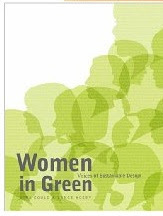 Most recently, my architecture savvy boyfriend gave me "Women in Green: Voices of Sustainable Design." What Kira Gould and Lance Hosey answer in their book about women and design is, why women? and, how? The book looks at whether gender is a determining factor of a sustainability mind set and acknowledges that there are certainly men out there that demonstrate the values of systems thinking, and environmental stewardship. However, they found that it is women, overall, that are more likely to base their decisions on environmental values and in prioritizing future generations. Through their jobs and vocalization of environmental priorities, to their "green consumerism," controlling upwards of 85% of the household spending decisions, they are at charge at home and at work in the outcomes of the developing green economy. As Hunter Lovins says in the book, "I keep hearing from male business leaders that the presence of women in the room, their energy, makes a difference in the outcome. I don't know what that means, but I keep hearing it." Beyond just gender relationships, the book delves into the shape and influence of a woman's agenda that has been growing the sustainability movement over the years. Arguably launched by the feminist movement and Rachel Carson's book, "Silent Spring," women continue to apply their energy and enthusiasm in fighting for justice and environmental stewardship inside and outside of the business world. Whatever tactic they take, they are most likely to argue for an end to business as usual practices that value the bottom line over future profitability. Profitability of our streams, our oceans, our soil, our air. A new definition of profitability is clearly in order and has been written about by Hunter Lovins in "Natural Capitalism." A joint project between her, Paul Hawken and Amory Lovins. While during the '80s and '90s women were encouraged to "act like men" in the business world, women will hopefully start to be encouraged to be women in the business world. To bring their nurturing to business and influence the practices of industry. What the book tackles are the squeamish responses, the fact that nobody wants to talk about heart, and the other elephants in the room that are preventing us from all coming to the table. When I talk to people about my interest in elevating the visibility of women in the sustainable food movement some get squeamish (leaders that don't want to be associated with gender issues), some get defensive, and others immediately delve into conversation. As the book points out, men are starting to join in the conversation. Ray Anderson, Interface chairman (a company that creates biological solutions to our modern world's design challenges) opening acknowledges women's contributions. He explains that, " A new day is dawning that will build on the ascendancy of women in business, the professions, government, and education. This is one of the most encouraging of all trends, as women bring their right-brained [emotion], nurturing nature to bear on the seemingly intractable challenges created by left-brained [logic] men and their pre-occupation with bottom lines and other 'practical' considerations. After all, it's the practical and pragmatic that got us into this mess. Surely, a different kind of thinking is needed to get us out ("Women in Green" pg 1)." As we watch women excel by leaps and bounds in both business and activism for a more sustainable planet, one of women's next biggest challenges will have to be to work to change the structure of business itself to allow women (that want to) to continue their familial lives while succeeding in their careers. As our culture does away with bottom lines, and thinks more about long-term relationships with people and the planet, women's place in decision making and business will continue to thrive. If you're interested in reading more, check out "Women in Green," a book that speaks to gender, women's roles, business, heart, and community; making the beautiful tie-ins between femininity, environment and our future. 1) The website - farmerjane.org - will be up in the next few weeks. 2) Planning, plotting, and networking for book release events. So far I'm helping plan a panel series at Commonwealth Club, a food and farming literary fest in collaboration with Eat Real, and numerous book readings throughout the Bay (Omnivore Books, Point Reyes Bookstore, etc). 3) "The Queens of Green," a new radioshow co-hosted by Deborah Koons Garcia and I will start on March 6. The show will run every Saturday morning (green960.com) and will be podcasted as well. A few of the first guests we're working on are Andrew Kimbrell and Raj Patel to cover GMOs and seeds - the theme of our show during March. I've been blessed by book endorsements from the following people whom I admire. Paul Hawken says, "As night and day are fundamental to our survival, the leadership of women is absolutely essential if we are to have a livable and sustained planet earth. With respect to agriculture and sustenance, the 20th century has been called the 'locust years,' a time when the industrial logic of machinery and chemicals supplanted the mythos of life and stripped away complex webs of family farms under the moniker of husbandry. Farmer Jane heralds a growing "womandry" movement that restores people, place, and nurturance back into the heart of our culture. It is a scrumptiously written testament to the role of women in bringing back the life of our soils and daily fare— a roll call of pathfinders, a heralding description of how women are stepping forward to cultivate biological farming, vibrant communities, and meaningful livelihoods." One of the most delightful advocates for sustainable food that I've had the pleasure to meet, Raj Patel, offers, "Personal, political, practical and powerful, Farmer Jane is beautiful field-guide to the future paths of the food movement. It works so well because it brings together everyone from farm worker organizers to fresh food activists and, with wit and wisdom, sparks the conversations and concrete actions that we'll need to transform our food system together. A wonderful book." What book about women and food could be complete without a word by Alice Waters? Indeed, I nodded to her contributions to sustainable foods in the introduction, but as a woman that has been instrumental by increasing awareness of the farm to school movement all over the country, I am humbled by her words, "Temra Costa is a tireless advocate for small-scale and sustainable farming in California. It is through this work that she has met and worked with the collection of inspiring, unrelenting women featured in this book. Farmer Jane is a work about good stewardship of the land and it is a joy to see so many peers, collegues and friends honored in this wonderful anthology." Tom Philpott of Grist and co-founder of Maverick Farms acknowledges the role of women in the food movement by saying, "The sustainable food movement is largely a women's movement--women run many of the farms, staff the non-profits, provide the vital intellectual and physical energy that propels the movement forward. This has been a largely untold story--and Costa has provided a critical corrective by documenting, at long last, to the massive contribution women have made to transforming our food system." While all of these aforementioned super-stars have inspired me over the years, NPR's The Kitchen Sisters (Davia Nelson & Nikki Silva), have taken investigative journalism, field visits, food and media to the next level with their "Hidden Kitchens" series. I feel all around honored that they love my book saying, "They say women hold up half the sky. They also hold down half the farms. Temra Costa's look at the growing sisterhood of women farmers and land activists is a revelation. Full of passionate, eccentric, off-the-chart kitchen visionaries, these resilient and outrageous women light the path for us to think about who is growing the food we eat and how they tend to the land and their communities. Even if you never thought of farming, or even gardening, it's full of tips on how to eat well, and make your community thrive." I hope you'll enjoy the blog full of food, farming and activism, the book, and the events (if they happen to land where you live).